Ask a Canadian where they’d send their friends and/or guests to experience Ontario’s great outdoors and many would suggest Algonquin Park or perhaps Muskoka or the Kawartha Lakes. They’d recommend swimming, canoeing and kayaking since Canada’s most populous province is blessed with oodles of warm lakes and sparkling rivers. While cottagers and tourists flock to these popular destinations, a growing number are now seeking out Northern Ontario’s French River. The first to be designated a Canadian Heritage River, this historic, 105 km-long waterway offers an experience that is as Canadian as butter tarts or, for that matter, (maple) sugar pie since the river travels through Franco-Ontario where French is the preferred language of most residents. The Lodge is owned and run by my life-partner Alex Strachan so I’m biased. But this also makes me a good guide to the middle portion of this historic river. You may want to stay in one of The Lodge’s 17 magnificent cottages – imagine breakfast complete with hot-from-the-oven croissants delivered to your door each morning in a hamper basket, gourmet coffee and exquisite tea, high thread-count linens and sipping a glass of wine on a screened-in porch overlooking the water. Or you might want to have an exceptional lunch or dinner in The Lodge’s wrap-around-verandah dining room. But regardless of whether you stay and/or eat at The Lodge, I encourage you to take Alex’s history tour. Three or more times a week for about three hours, Alex powers up his boat to take a small group to his favoured places while regaling them with stories of Canada’s extraordinary past. Afterwards, anyone who thinks Canadian history is boring (almost all Canadians) will be converted. (To book a spot call 705-898-2500 or visit History Tour.) Though born in the U.K., Alex brings the granite, white pine and oak forested landscape to life. His explanation of how the fur trade or, as he correctly calls it, the trade in beaver pelts, shaped our nation will help you appreciate the fine line danced by Canada’s founding fathers. Confederation in 1867 was almost a miracle given the competing demands of the British and our American neighbours. Alex will show you a portage that’s so old and well-used by voyageurs as they journeyed in massive canoes from Lower Canada to the West that the granite is worn down. With your new appreciation of our rich past, it’s time to explore the French on your own. If you are staying at The Lodge, you can swim, canoe, fish, kayak and hike (in spring and fall) right from The Lodge’s beach. But you needn’t be a Lodge guest to explore the French River since there are plenty of other lodges and inns nearby. Moreover, both shores of the river’s entire 105k length makes up the French River Provincial Park. It’s one of only a few water-access-only protected areas in the province. And while having to paddle or motorboat into the park makes it a bit more challenging to visit, it also means that on a holiday weekend in July or August, campsites are available and you can paddle all day and only come across a handful of fellow boaters, most of them in canoes, kayaks or tin fishing boats. And while I’m on the topic, the French is home to bass, pickerel, pike, muskie and more. Hard as it might be to imagine, you can paddle pretty much the entire French River in either direction. That’s because it is really a series of lakes and drops and not a river at all. This unique feature means the French is ideal for paddling loops. The most popular are a day trip around Commanda Island, a three- or four-day paddle up the main French and back down the Little French (ask at The Lodge for details) and the five- or six-day route around 18-mile island. (See details of the 18-mile island trip.) Each involves some portaging, but the portages are short. Furthermore, the latter route around 18-mile island travels along a five-mile-long stretch of rapids. They are class one so fun for white-water paddlers and portagable for those who prefer flat water. 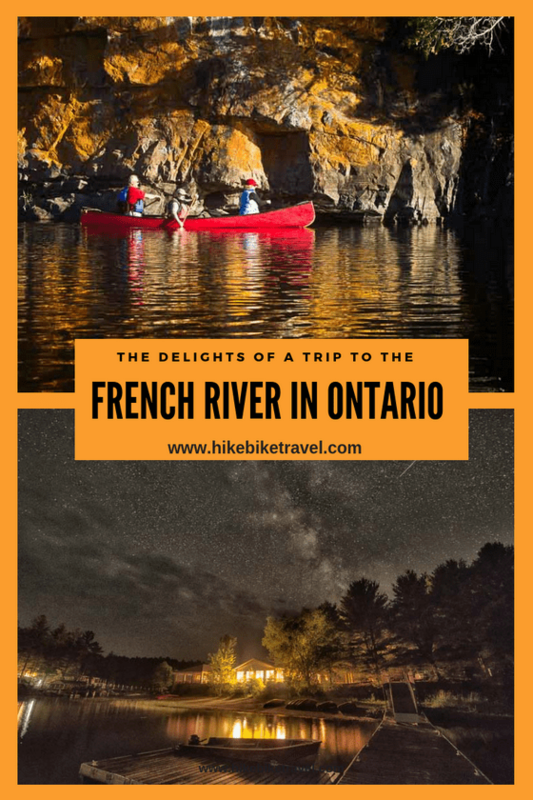 The French River is a refreshing change from Ontario’s ever-busier lake country. You don’t have to be that adventurous to appreciate its many paddling and swimming opportunities as there is plenty of camping and numerous places to stay on the river. So do yourself a favour and explore the French. For canoeists, paddling the French River doesn’t rank high. It has limited whitewater and its rapids are Class One at best. It’s a long old drive from Toronto to the French (four hours) and much of it feels more like a still-water lake than a river. So why is it that almost every canoeist I know has paddled the French – sometimes multiple times? Thank you to Nicola Ross for another great guest post. She is the author of Southern Ontario’s highly successful Loops & Lattes Hiking Guides. She is an avid hiker and keen writer. To sign up to receive her weekly newsletter about hiking, visit her website.